Faced with greenhouse gas emissions at every stage of the production chain, the timber industry has a choice. It could look at reducing emissions. Or it could attempt to greenwash its operations, in effect attempting to evade responsibility. Perhaps not surprisingly, given its record, the industry is opting for the latter. 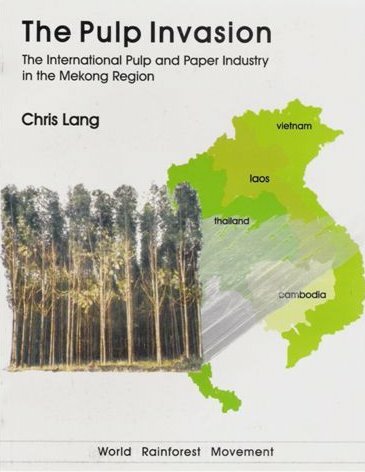 The UN Food and Agriculture Organisation has long served as an apologist for the timber industry, in particular for the pulp and paper industry and industrial tree plantations. Two years ago, the FAO and the International Council of Forest and Paper Associations (ICFPA) commissioned a study aiming to “raise the industry’s profile in international negotiations on global warming”. That would be a worthwhile aim if it meant attempting to reduce the emissions caused by the timber industry. The report was released earlier this year and is titled, “Impact of the global forest industry on atmospheric greenhouse gases.” The report does not look at how the timber industry can reduce its emissions. Instead it attempts to spin the timber industry as part of the solution to climate change, rather than part of the problem. 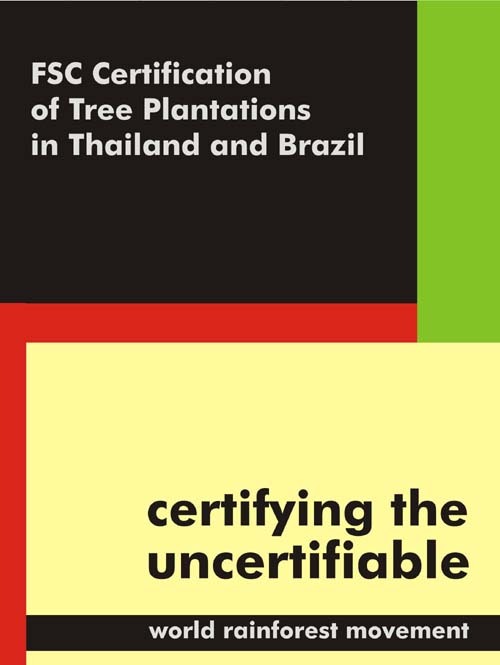 “We think [the report] is an important attempt to present the climate profile of modern forest management and industries impartially, based on solid facts and figures,” writes FAO’s Michael Martin in the introduction. But the report is neither impartial, nor is it based on solid facts and figures. The author of the report, Reid Miner, works for the National Council for Air and Stream Improvement (NCASI), which was established more than 60 years ago by the pulp industry. 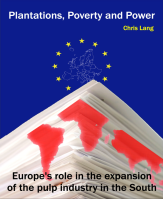 Contributors and reviewers of the report include representatives of ICFPA, the Confederation of European Paper Industries, FAO, the Advisory Committee on Pulp and Wood Products and NCASI. “Few recent data are available for characterizing accurately the types of land converted to planted or assisted semi-natural forest,” Miner writes. Given this lack of data, Miner concludes that the “carbon-related impacts” of establishing plantations “cannot be calculated with certainty at the global level.” He then “calculates” that the carbon-related impacts of establishing plantations is zero. Miner’s argument is simple. 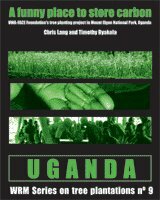 Establishing plantations on non-forested land results in an increase in carbon absorbed, while clearing forest to make way for plantations results in increased emissions. 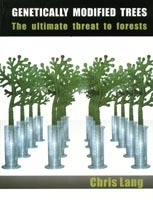 The 1.6 million hectares a year of plantations established on non-forested land would “approximately offset the losses associated with forest conversion of 1.5 million hectares per year.” This focus on carbon sidelines the social and environmental impacts of converting biodiversity rich grasslands to monocultures, as has happened over vast areas of South Africa. But Miner’s figure for emissions caused by establishing plantations is not based on any facts or figures – solid or otherwise. Miner’s source is a report that he co-authored in 2007: “The Greenhouse Gas and Carbon Profile of the Global Forest Products Industry.” (Which, coincidentally, sounds remarkably similar to his latest report for FAO.) In 2007 he wrote that “This finding, however, is subject to considerable uncertainty.” It could, in fact, be “several hundred million tonnes of CO2 equivalents above or below this ‘net zero’ finding”. So, Miner’s solid figure is zero… plus or minus several hundred million. The timber industry uses lots of biomass (otherwise known as waste products) to produce energy in the manufacturing process. Miner explains that “the CO2 released when wood is burned is part of a natural cycle and is offset by growing trees”. According to Miner, and the Kyoto Protocol, biomass therefore results in no emissions. The problem is that burning biomass does result in greenhouse gas emissions. These emissions may be subsequently absorbed by growing trees, but that could take decades. And some biomass does result in huge additional emissions – when plantations are established on peat swamps, for example. A paper published in Science magazine last year argues that this biomass accounting error should be corrected. 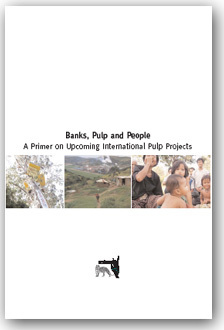 Needless to say, Miner does not mention this paper in his report for FAO. All industries have their own organisations to promote their point of view. The various organisations that helped produce Miner’s report fall into this category in the case of the timber industry. But the FAO describes itself as “a knowledge network” to “collect, analyse and disseminate data that aid development”. It is funded by tax payers. So why is it helping to promote the timber industry’s greenwash? ← What is carbon trading for?